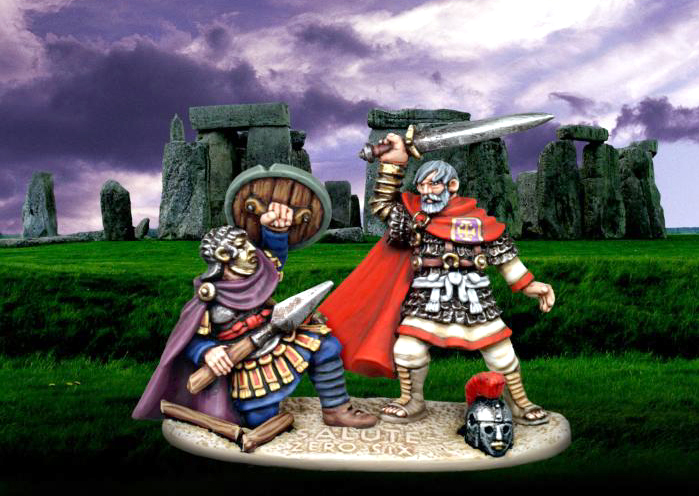 This first ever painted version - by Warlords member Kevin Dallimore - is painted as a "realistic" pair with Arthur in late, Romano-British gear and Mordred in a late Roman cavalry helmet. Lower down the page you can see some initial sketches of the figure by Warlords member Martin Buck, the model in green putty before it went into the mould and the photographic poses that helped in the design work. Click here to see this set painted by other Warlords club members. The figures and base are cast separately to allow maximum flexibility and the first 5000 people through the door at Salute Zero Six will get one of these splendid pieces FREE in their carrier bag (along with other goodies). Last year's St George and the Dragon was very collectable and this year's figure will undoubtedly be highly sought after.